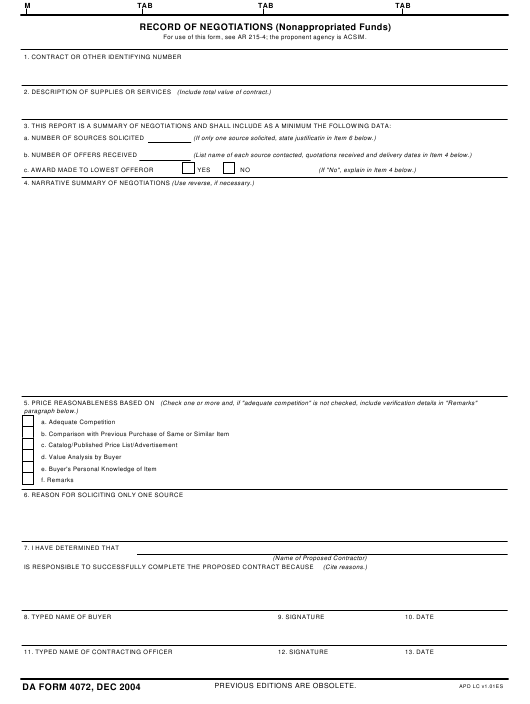 DA Form 4072 - also known as the "Record Of Negotiations (nonappropriated Funds)" - is a Military form issued and used by the United States Department of the Army. The form - often mistakenly referred to as the DD form 4072 - was last revised on December 1, 2004. Download an up-to-date fillable PDF version of the DA 4072 below or request a copy through the chain of command. For use of this form, see AR 215-4; the proponent agency is ACSIM. 5. PRICE REASONABLENESS BASED ON (Check one or more and, if "adequate competition" is not checked, include verification details in "Remarks"